you knew you were between life and death." 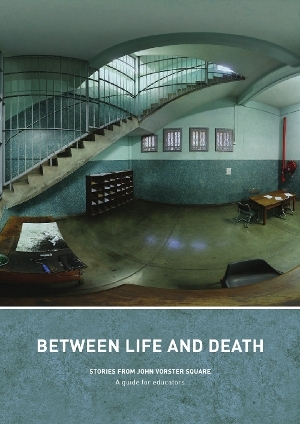 This guide for educators is based on the DVD, Between life and death: stories from John Vorster Square, a virtual walk through the police cells of the 10th floor of South Africa's most notorious police station, where the security forces reigned in apartheid South Africa. Commissioned by SAHA as part of the SAHA / Sunday Times Heritage Project and produced by Doxa Productions, the DVD features interviews with former detainees and security police as well as photographs, press clippings, drawings and other archival materials. This guide, developed in collaboration with Shikaya, draws on the DVD to provide educators with sources, lesson plans and activities to teach aspects of apartheid history in line with curriculum requirements. How did the work of the TRC help South Africans confront the past? What was the psychological impact of violence? What contribution did the arts make in the resistance to apartheid? What was the role of religious organisations in resistance to apartheid? What kind of support did detainees have? To purchase a copy of the guide and DVD, please contact our offices on 011 718 2560, or email info@saha.org.za.